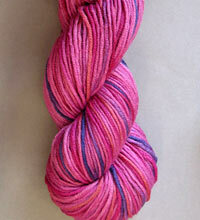 Pinks in multiple light and dark shades with touches of purple/blue. 8 ply handpainted merino wool yarn in a bevy of colors - this dense, tightly plyed merino is soft and silky and knits up into delicious sweaters, booties and hats. With lots of body and gorgeous hand.